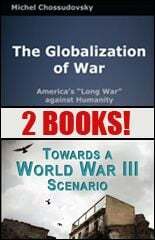 America’s hegemonic project in the post 9/11 era is the “Globalization of War” whereby the U.S.-NATO military machine —coupled with covert intelligence operations, economic sanctions and the thrust of “regime change”— is deployed in all major regions of the world. The threat of pre-emptive nuclear war is also used to black-mail countries into submission. While one can conceptualize the loss of life and destruction resulting from previous wars including Iraq and Afghanistan, it is impossible to fully comprehend the devastation which might result from a Third World War, using “new technologies” and advanced weapons, until it occurs and becomes a reality. The international community has endorsed nuclear war in the name of world peace. “Making the world safer” is the justification for launching a military operation which could potentially result in a nuclear holocaust. Also available in PDF format, click here to order.